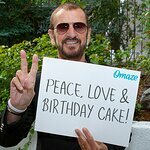 Ringo Starr celebrated his birthday on Saturday, July 7, 2018, in Nice, France, where he joined friends and fans in front of Hard Rock Cafe Nice to share a “Peace & Love” salute at noon. Ringo was accompanied by friends and family including his wife, Lady Barbara Starkey, his brother-in-law Joe Walsh with wife Marjorie Walsh, Matt Sorum, and his All Starrs (including Graham Gouldman, Colin Hay, Steve Lukather, Gregg Rolie, Gregg Bissonette and Warren Ham). The now traditional “Peace & Love” moment invited fans from around the world to say, think or do “Peace & Love” at noon their time. This year’s tribute included celebrations in more than 60 countries. At the event, Rudy Salles, Deputy Mayor for The City of Nice, welcomed the crowd, spoke to the importance of “Peace & Love” day and introduced a musical tribute, which was performed by Ringo’s current All Starr band. They played “Act Naturally” and “With A Little Help From My Friends,” and were joined by Joe Walsh who performed “Funk 49” before introducing the birthday boy – Ringo. Then the group did a countdown to a noon “Peace & Love” cheer, tossing out “Peace & Love” wristbands and Peace cookies to fans. Starr began the tradition of celebrating a “Peace & Love” birthday with Hard Rock 10 years ago, when he and his wife Barbara joined throngs of fans on the streets of Chicago. The next celebration was a traffic-stopping event in front of Hard Rock Cafe New York in Times Square, with additional birthday stops in subsequent years at Hard Rock Cafe locations in Hamburg, Germany and Nashville, Tennessee.